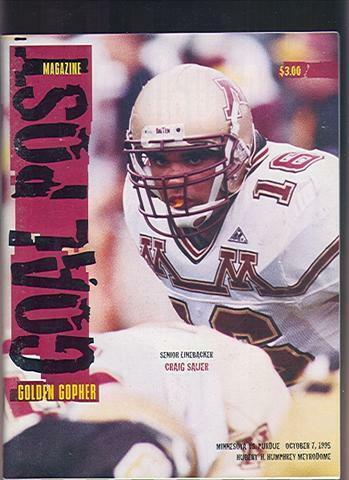 The Gophers went with a radical change to their helmet design in 1992. 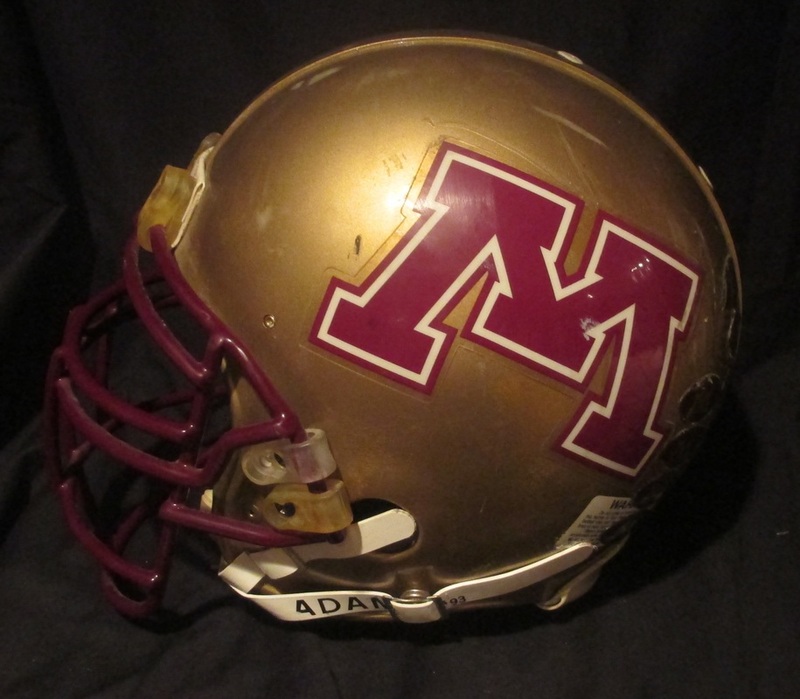 This was their first use of the gold helmet since 1976. 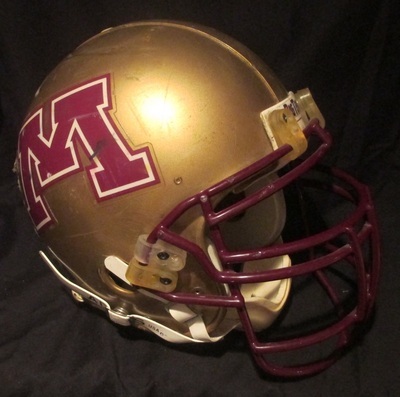 The U stayed with the brick M on the sides of the helmet, but the M got larger or "fatter" than the one used in 91, and was also maroon in color with a white inner border. 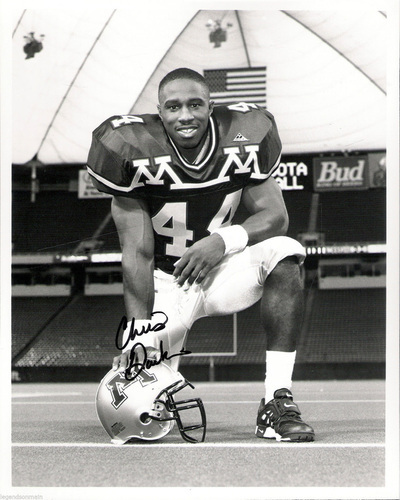 The Big Ten or Gophers decal was used on the front bumper in 1992, but just the Big Ten decal was used after 92 to the best of our knowledge. 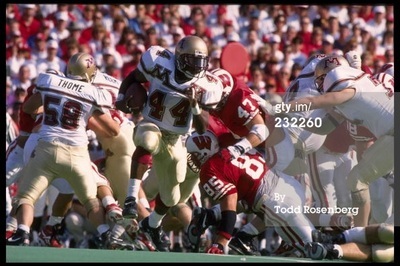 A small circular players # decal was used on the rear of the helmet, and for the first time in many years, the award decal was brought back in 1992, which can be seen below on Antonio Carter's 1992 game worn helmet. These were maroon football with a clear brick M in the center, which looked gold when applied to the helmet. 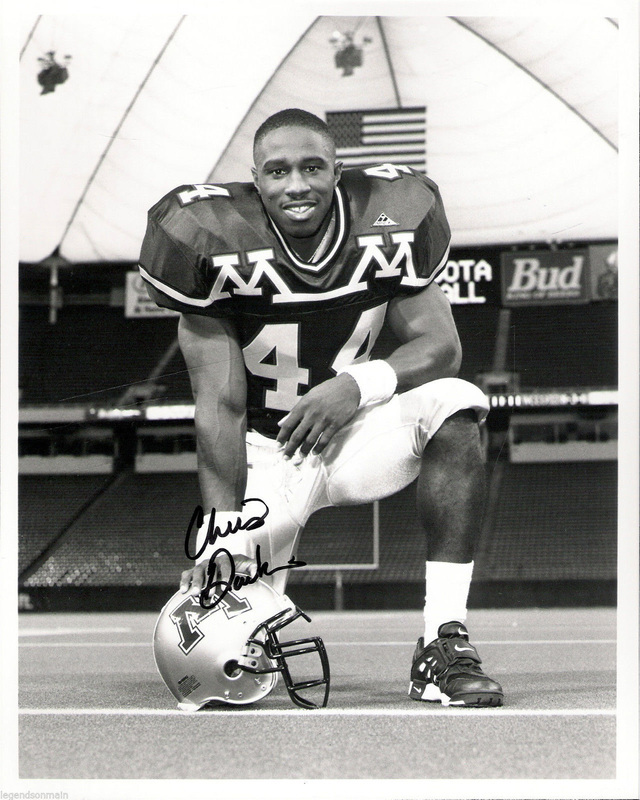 These award decals were only used during the 92 season, and discontinued thereafter, and have not been used since. 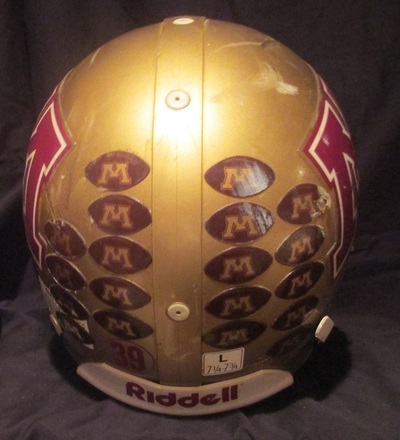 The football decals were awarded to players for "big plays" or reaching certain positional goals. We've not been able to find the particular criteria. If anyone has access to this information and could pass it on, it would be greatly appreciated. Both Riddell and Air model helmets were used during this era according to player preference. 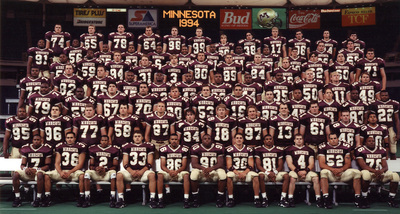 The 1992 uniform also went a drastic design change from the previous season. 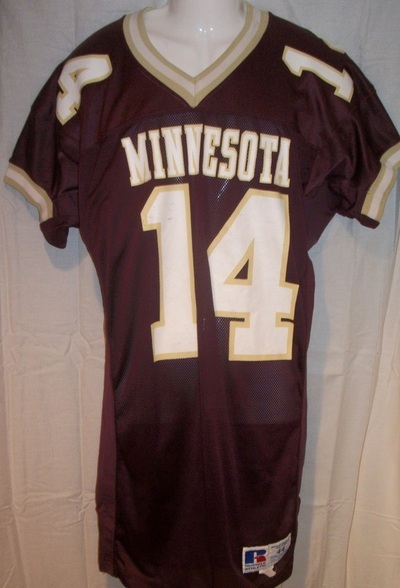 The jersey was made by Russell, added a spandex side panel, and the maroon changed to a darker or more brown maroon. 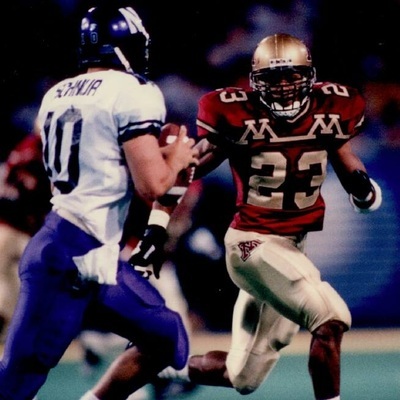 The biggest change was adding the Minnesota to front of the jersey, which was the first time the Gophers ever used on their football jerseys. The letters and #s were all screened on. The maroon jerseys had white letters and numbers bordered in gold, while the white jersey had maroon numbers and letters bordered in gold. 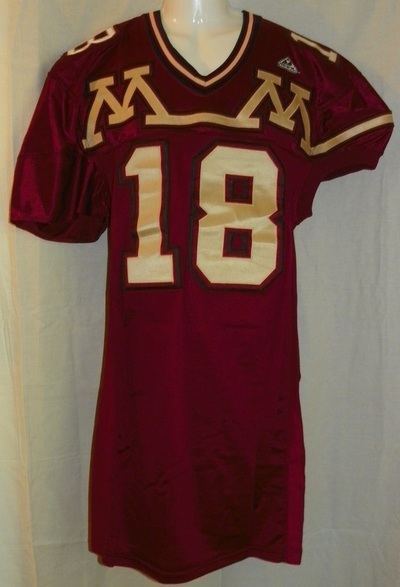 Gold pants were worn with both jersey colors and had maroon brick M's with a white inside and a thin maroon outside border. Black shoes and white socks were worn. 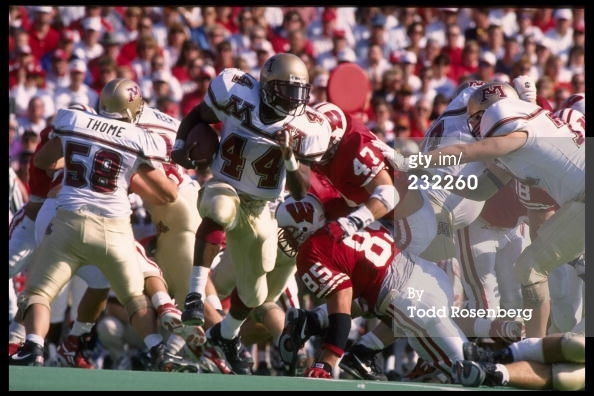 The 1993 uniforms were the exact same as the 92 uniform. The 1994 uniform marked another huge change, and produced the most radical Gopher jersey design in Minnesota history. 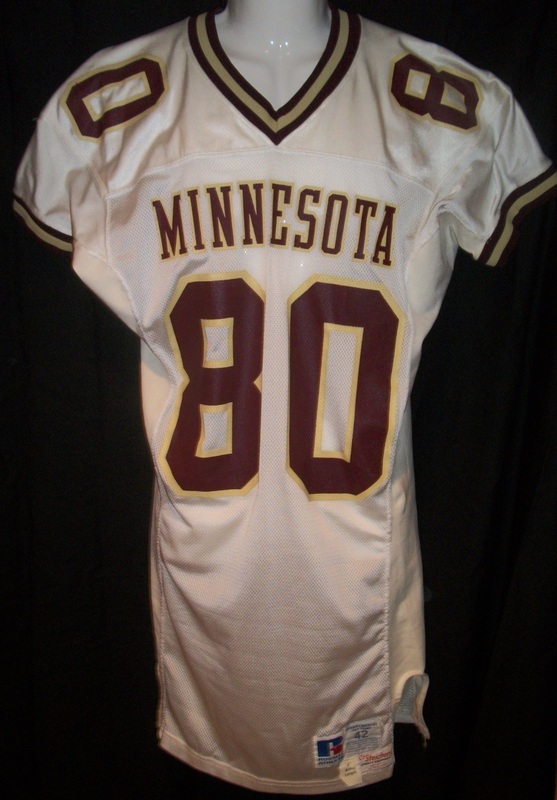 Apex, a short lived company which made jerseys for Minnesota, Iowa, and Wisconsin (that we're aware of in the Big Ten, and a number of NFL teams) produced our jerseys. They folded at some point in 1995 so the Apex patches were removed. 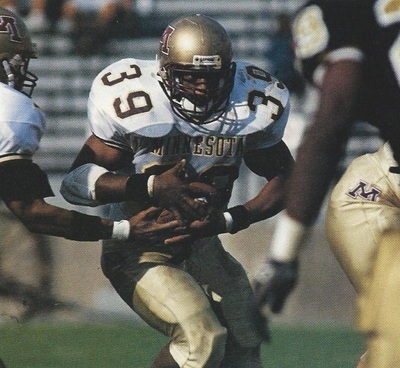 If you own one of these rare jerseys, if it still has the Apex patch, it was only worn in 1994, if the patch was removed, it was worn during the 1995 season, and possibly the 94 season as well. These jerseys were disliked by many of the players as they were so thick, heavy, and hot during the early fall games. 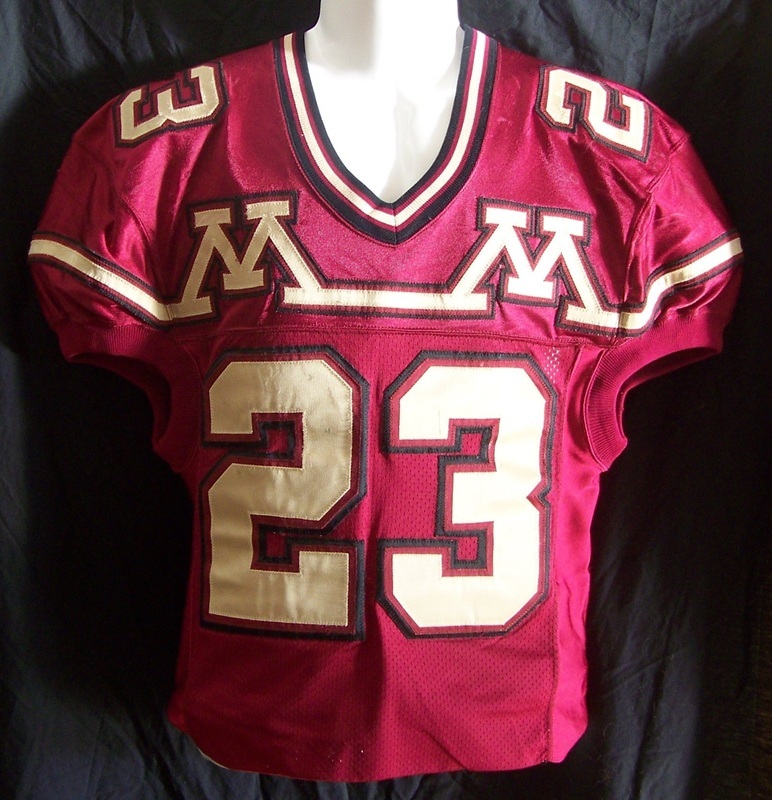 These M & M jerseys had tripe sewn #s and M & M design. 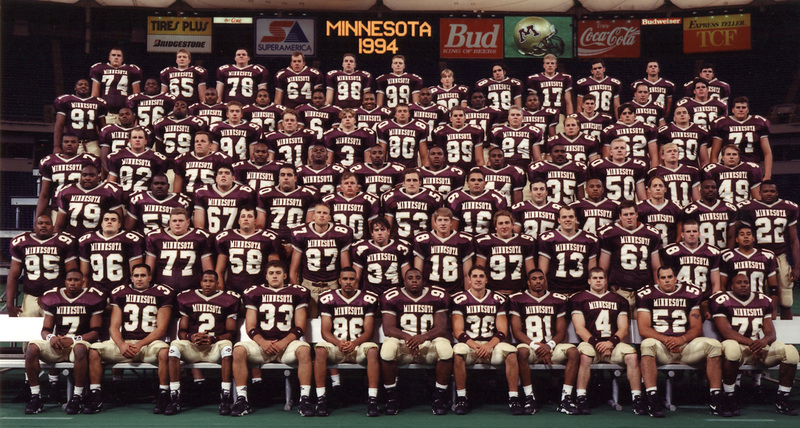 The maroon jerseys had gold #s with a maroon inside, and black outside border. 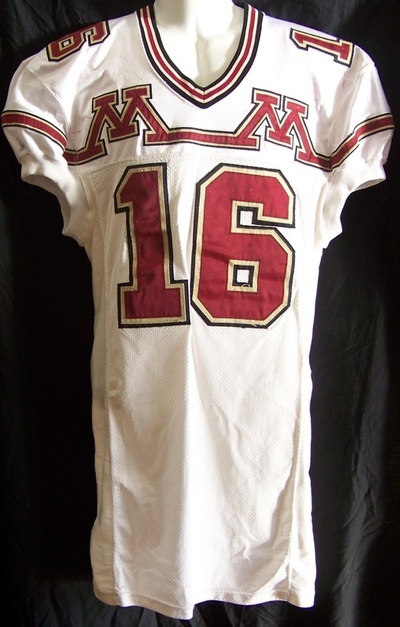 The white jerseys had maroon numbers with a white inside border and black outside border. The maroon jersey had gold letters on a nameplate, and the white jerseys had black letters on the nameplates, both single layer sewn. 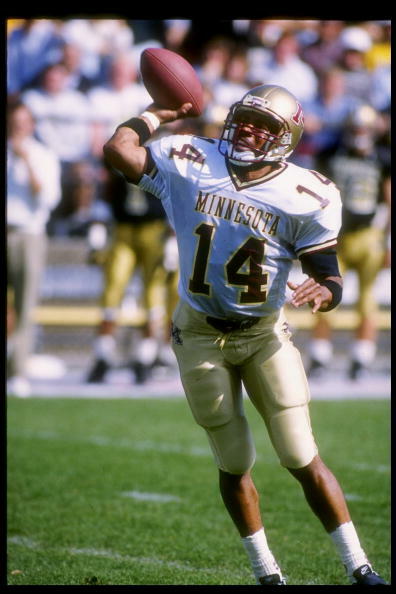 Gold pants were used during these two seasons with both jersey colors. 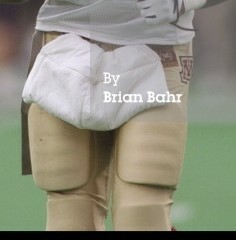 These pants had a brick M on the hips in maroon with white inside, and black outside border. The Apex patch, which can be seen in 94 was also removed in 95. Another change was the Big Ten 100 year Anniversary patch that was worn on the upper left area of the pants. Each Big Ten team wore the patch this season, with most wearing them on their jerseys. Each patch was in that school's colors. Black shoes with white socks were worn.